The data-quality objectives of the National Water-Quality Assessment Program include estimating the extent to which contamination, matrix effects, and measurement variability affect interpretation of chemical analyses of surface-water samples. The quality-control samples used to make these estimates include field blanks, field matrix spikes, and replicates. 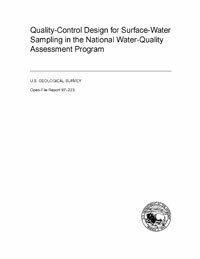 This report describes the design for collection of these quality-control samples in National Water-Quality Assessment Program studies and the data management needed to properly identify these samples in the U.S. Geological Survey's national data base.